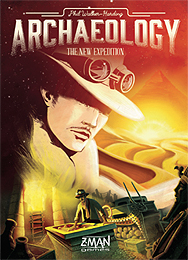 Dig, explore, trade, and sell in this fascinating card game as you attempt to complete and collect valuable artefacts. Sell your collections before they get swept away by sandstorms or stolen by theives. Explore pyramids, mines, tombs and more to get your hands on precious treasures. Prove to your colleagues that you do not belong in a museum. This new edition of Archaeology introduces tents, six different monuments to explore, and new artefacts. One of my favourite card games ever. Easy to pick up and some simple and great mechanics - draw a card, play cards. Set collection, push your luck, hand management and 'take that' elements all come together in this fantastic game, suitable for families and more experienced gamers alike. The aim of the game is to collect sets of archaeological artefacts by 'digging' (drawing a card), trading with the central market place, and discovering hidden cards in pyramids and various other locations by collecting map cards. Each set of artefacts has it's own value, based on it's rarity, and these rarer sets are obviously more difficult to obtain, and hold onto! There are map cards to discover which will get you into hidden chambers in the pyramid (although in this new version there are other 'monument' locations with treasures to discover), and there are also cards that mess with the players. When drawn the thief card allows you to steal a random card from an opponent, while the sandstorm card when drawn means that players have to put half of their hand in the open market, where items are then liable to be bought by other players. In this new edition each player starts with a 'tent' card which can be used to cancel out one sandstorm event (very useful!). It is very satisfying to work towards collecting a set and then selling it at the right moment, and this can often result in players pushing their luck or cashing in on the more numerous artefacts, which are easier to collect but have a smaller value. The 'take that' thief cards are absolutely brilliant and result in much mind games and banter, especially if other players know you have a valuable card that they want! The game now plays up to 5 which is great and I highly recommend this game to anyone who likes fun!